Learning how to treat heat rash and diminish the effects of this skin condition can come in extremely helpful when discomfort strikes. 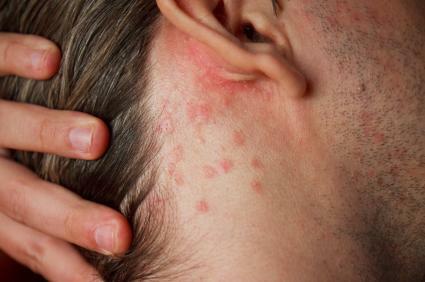 This type of rash is also known as prickly heat because of the tingling sensation some may experience. The rash appears when a heated body attempts to cool down through perspiration, causing the sweat glands to become blocked. Use these steps to reduce the appearance of this sometimes painful rash. It's important to begin treating the rash as soon as possible. You may have to continue treatment for several days. Immediately seek shelter in a cooler area. If outdoors, seek shelter inside. If indoors, use a fan or air conditioning to bring down the air temperature around you. Remove your clothing. Clothing over the rash will cause friction, increasing the severity of the condition. Rinse away the sweat from the skin using cool, not warm, water. Do not use soaps or lotions on the rash. Pat the skin dry, do not rub the sensitive skin. Apply cool, not wet, compresses to the rash areas. Keep the skin cool but moist. Take a temperature-reducing medication like acetaminophen or ibuprofen. If treating a child, rely on the pediatrician's dosage recommendation. You don't have to buy a compress; you can make one with items found around your home. Here's how to make a good compress that won't leak or leave the skin wet. Fill a sturdy zippered storage bag a third to a half full of ice. Close the bag and tilt it upside down to verify that the zipper is closed securely. Find a thin towel or washcloth to cover the bag with. Pin the cloth around the ice bag using secure safety pins or hold the cloth in place while applying a compress. Heat rashes are common among infants and children, but adults can develop them too. Review this list of heat rash causes to become familiar with the condition. If you recognize it immediately, chances are you will be able to find relief much more quickly, too. Heat rash happens frequently and for most people, it isn't a serious condition. However, Family Doctor recommends that you see your physician if you experience any of these accompanying symptoms. If your rash lasts longer than three days or it worsens, you should visit your doctor. Read more about learning how to treat heat rash by visiting MedHelp or WebMD. It's important to pay attention to your skin. If you are prone to rashes, make skin examination a part of your skin care regimen. Catching heat rash early and good care will prevent the rash from spreading or becoming painful.